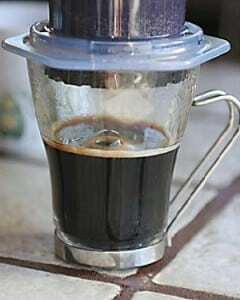 There are plenty of ways to make filter coffee without a machine designed specifically for the purpose. All you need is something to heat water and something to filter the beans from the water. Espresso is a different animal, the machines to make them are not quite so simple, they are not just for convenience, they are necessary to achieve the brewing conditions that espresso by definition requires. Espresso is made by forcing water through a puck of fine ground and compacted coffee, usually but not necessarily a dark roast variety. It is the pressure that’s the key, an espresso machine uses 8-10 bar of pressure to force the water through the grounds. It is dangerous to consider firing scalding water at anything, anywhere, so making true espresso at home without a machine is not really possible or a sensible thing to even attempt. So What’s The Next Best Thing? You can buy a really inexpensive stove top espresso maker, which uses heat to generate around 1.5 bars of pressure. This forces pressurized water/steam through fine espresso coffee grounds similar to standard steam pump espresso machines – the only difference is the amount of pressure used. Here is our list of the the smallest stovetop espresso makers sold today. They are almost all very affordable and pretty small too. You can also see this post to learn more about the differences between stovetop espresso and true espresso. 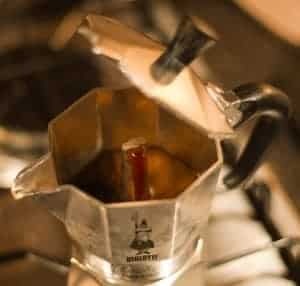 The beans used for a moka pot are the same kind and consistency as that of true espresso, and you can make a great drink this way once you get the hang of it. But the best part of all is that it keeps the art in the process. The fancy machines which cost so much more money can take something of the romance out of coffee making, and while they are the best answer for those who like a quick, convenient and good cup of coffee, there’s a side of it that’s lost. As I alluded to above good espresso machines cost a lot of money and they take a lot of dedicated space on your counter. There are smaller and cheaper espresso machines but most of them are hard to use and they just don’t perform well. The espresso machines priced below $100 are usually affordable for most people but the qaulity of espresso you get will always be suspect… and around here we think that if you aren’t going to be making high quality espresso in your kitchen you might as well spend less money and get yourself a super cheap Aeropress which can be used to make a drink similar to espresso. Most people love the quality of coffee made from an Aeropress and it has the added benefit of being super portable – people take these things camping for crying out loud! An Aeropress also works a bit like a manual pump, pressing pressurized water through coffee grind and filter leaving you with a potent brew in your cup. This is a lot like a moka pot but because you press coffee through a paper filter it ends up feeling cleaner (less fines) which many people appriciate. We’ve got a full review of the Aeropress here for you to read or you can see this post comparing the Aeropress to stovetop espresso for more information. Now, I know what a lot of you are thinking – I don’t have an Aeropress but I do have a french press. Can I just make espresso with the french press instead? Although a french press brews by you pressurizing the coffee, the pressure generated is negligible and much less then you get while making stovetop moka, Aeropress coffee, or true espresso. For people who have a really good french press the best way to replicate something similar to espresso is to use a finer grind than you normally would and brew your coffee for a shorter amount of time. Instead of brewing coarse grind in a French press for 4 minutes maybe you could experiment with brewing a medium-fine grind for two minutes and then pressing just the same as you would have otherwise. The fine grounds will press into the mesh strainer causing a good deal of solids to pass through but many of the gaps in the strainer will nearly clog giving you extra pressure in your extraction. It’s worth keeping in mind though that this is probably the worst version of espresso on this list. Your coffee will be a weirdly brewed french press coffee and will be full of grit. Be prepared to not drink the last of your cup and press pot and do not expect to get the potency of espresso or any crema at all. I should rephrase this claim before you really think this is espresso. With this method you will be making something similar to Turkish coffee rather than espresso. Turkish coffee is similar to espresso in strength and potency but it is different and it is actually pretty similar to making cowboy coffee on a campsite somewhere. With Turkish coffee you would traditionally use a special turkish coffee pot but the vast majority of people don’t own these. In it’s place you will just take the smallest sauce pan you have and put it on the stove filled with simmering water and ultra fine coffee grind. Most grinders will make a decent espresso grind but we recommend some of the mid range Baratza coffee grinders to give you quality grind consistency from coarse grind all the way to the ultra fine Turkish grind size. As you prepare your coffee you need to keep in mind that the goal is to make a potent batch of coffee and not pressurized espresso with crema. Properly brewed Turkish coffee will give you portion sizes and strength that espresso drinkers or mixed espresso drinks require. They will have more body than true espresso though so like a french press stay away from the last bit of coffee as it will be packed with solids. Anyone wanting to learn the art of making coffee could appreciate the control offered by the stovetop coffee makers, they allow for a world of variables and experimentation, the result of this practice is the perfection: a coffee that suits you personally that only you know how to make. It’s a skill isn’t just about pressing some buttons and leaving the magic to the engineers. While operating an espresso machine is certainly a skill in itself, if you’re the sort of person who wants to learn about making coffee the best way to do this is to limit the work of the equipment you’re using and do as much of it yourself as you can. With care and attention you really can match the top machines with a cheap and simple metal pot, lots of passion and persistence. Angelo Moriondo, an Italian engineer, came up with the brilliant idea of a steam-driven instant coffee machine in Turin back in 1884. Improvements to the initial machine were made by Luigi Bezzera of Milan seventeen years later. These two inventors developed their machines on a design similar to the automatic drip coffee maker of today. The difference though is that the amount of pressure forced upon the coffee grind is much higher. In other words, the water pushes down upon the beans very fast, like the showerhead of an automatic drip coffee machine on steroids. This explains the idea of Moriondo, the faster the water is forced unto the beans, the faster the process becomes which makes it “instant”. This is also how the name of the coffee came about. Espresso is Italian for “expressly” or fast. The Espresso crave eventually spread throughout Italy with the cultivation of “espresso bars” or coffeehouses. These came about since the Espresso was something new and fresh and since those machines were expensive, only commercial establishments had the capital to serve them. As with Italy, the satisfaction of enjoying Espresso and the social interaction that went along with it caught on with the rest of Europe. Espressos are now among the most famous types of coffee out there. This is particularly due to a well-known coffee establishment which began in Seattle popularizing the beverage. Before that though, Espressos already had a strong following in Europe, especially in Italy where one would find Espresso bars in just about every corner. Needless to say, the Espresso started to take over the world by storm after sales picked up in the United States in the 80s. The demand for this coffee was so great people wanted to have the convenience of being able to make one in the comforts of their own home. Thus, the Espresso machine started selling out like hotcakes. This only served to further the popularity of the Espresso. Unfortunately, the convenience brought upon by Espresso machines has put Espresso fanatics all over the world in a hard place. What if you, dear Espresso lover, find yourself in a place without one? 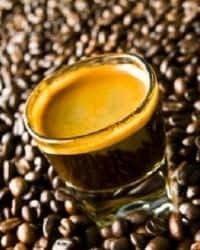 The goal of this article then is to enumerate ways in which you can still make Espresso without having an automatic Espresso machine. But before that, let us discuss the history of the Espresso and what makes it a must-drink beverage in the first place. Unlike other types of coffee, Espressos are brewed with the use of very hot water and forced into the coffee intense pressure. In other words, the Espresso brewing process is a combination of percolation and Automatic Drip albeit at a very fast rate. The super-hot water is created through the use of pressure (a topic discussed greatly in our pressure cooker articles). This water is then forced through the beans as one would in an Automatic Drip Coffee machine but in Espressos, the amount of force is much more powerful, as in 132 pounds per square inch powerful. The resulting beverage is thick and creamier than other types of coffee, its signature look. It also has a stronger taste. These two characteristics are the result of the high pressure brewing process and a greater presence of caffeine in Espressos compared to other types of coffee. Espressos require a fine grind of coffee, as fine as the texture of confectionary sugar. Master barista Giorgio Milos says that the perfect espresso has seven to eight grams of freshly ground roasted coffee which has been roasted two to three days in advance and is preserved using pressurization. Furthermore, the water used in the brewing process should be no less than 190 degrees Fahrenheit and no more than 200 degrees Fahrenheit with a pressure of 9 bar of force. Ideal extraction time is from 25 to 30 seconds. It’s very important here to use fresh ground coffee, not pre-ground! You will notice a difference in taste otherwise. The fine ground beans are placed in what is called a portafilter, a cylinder about 2 inches in height with a filter in the bottom and a handle. The bottom of the portafilter is attached to what looks like a faucet from which the espresso comes out. It is also recommended that one drink an Espresso as quickly as possible. Also known as “Espresso shots”, drinking an Espresso quickly is a means to enjoy the full flavor an Espresso offers. The crema, the emulsion of the coffee’s oils, that forms on top of the Espresso keeps the aromas of the coffee in. You shouldn’t wait for the crema to dissipate because when this happens, the aromas and the flavor of the coffee vanish with it. The Espresso machine is thus made crucial because of its ability to do two things. Firstly, it is able to generate super-heated water and secondly, it is able to push as much force of water through the coffee beans. The closest coffee appliance that resembles the Espresso machine is the Moka pot which we have discussed in a previous article. Basically, the Moka pot, like the espresso machine is able to generate super-hot water as well as apply some amount of pressure into the coffee beans. Like the Espresso, Moka pot brewing also uses a fine grind to make the permeation process much easier and faster. Also, the coffee yielded by the Moka pot is thick and creamy, but not on par with the Espresso. Unfortunately, as mentioned in the conclusion of our Moka pot vs. French Press article, Moka pots are unable to truly emulate the taste of an Espresso. This is mainly because the force generated by the Moka pot is nowhere near the force generated by the Espresso machine. This gives the Moka pot brews a distinct flavor which is unlike the traditional drip brews nor the Espresso. This is all about me. How Big Is A Coffee Scoop?